For a long time now, Sitecore has enabled the ability to integrate videos with some of the biggest names in the paid video platforms out there, such as Brightcove or Ooyala, and for good reason. Those platforms offer many advantages over the free versions. However, they are often expensive and an overkill for most websites who may only have a small collection of videos. These users often resort to YouTube or Vimeo and their respective standard embed options to show these videos in Sitecore. This fails to create a true integration between the platforms. I’m pleased to close that gap slightly by releasing the Vimeo Connector of the Sitecore Media Framework. 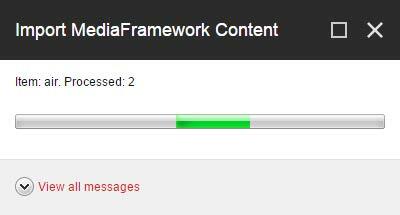 Please note that Sitecore 8.2 REQUIRES Media Framework 2.2 or higher. In order for the Sitecore Media Framework reports to work, a new fact table must be added to the Experience Database (xDB) reporting database. A script that will create this new table is available on SDN. You must run this script on your xDB reporting database. This step should be completed by your database administrator. Note It is possible to install multiple Sitecore Media Framework connectors. This script only needs to be run one time per reporting database, regardless of how many different connectors you have installed. Sitecore Media Framework can be installed in a multi-server content authoring environment. If your Sitecore environment is configured in this way, you need to configure the following. If you are using the scheduler to synchronize media, only one content management (CM) server needs to have the scheduler configured. Remove the scheduled job from the config files on the other CM servers. The Sitecore event queue will handle keeping the other CM servers in sync. The following covers how to create an account in Sitecore that corresponds with a Vimeo account. While in your app details page, click the “Authentication” tab. At the bottom of the page, you’ll see the “Generate an Access Token” section. COPY this token. IMPORTANT: Vimeo will NOT show this token to you again. Make a copy and store it somewhere. If you lose it, you’ll need to generate another token. Once the account item is created, enter your App ID and your Token into the appropriate fields. In the “Default Video Player” field, choose “default player”. (More details on the players will be added in the future). A Sitecore content author or administrator can manually trigger the media import process. Click on the “Import All” button. You should now be able to see your vimeo content under the “Media Content” folder under the Vimeo Account item. Please note that videos and tags are bucketed, so you’ll need to use the search interface. I’ll update this post with additional instructions soon, but that should get you started.